Once again, the months just slip by while I fail to blog. Oh well. Here's one I finished the last little glass of last night. 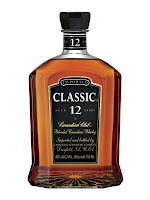 Man, I don't know about this Canadian whisky thing. I like the stuff, but I think I haven't had enough of it to taste it properly. I'm getting a lot of what I got with the Forty Creek Barrel Select last time: caramel, sherry...hmm, hold on. Not much spice, unlike the Forty Creek...more on the sweet. Toffee, vanilla, honey... Lots of alcohol, though. Needs a lot of water to really bring the flavors out. A hint of ginger. Overall, a very pleasant drink, although I prefer the Forty Creek Barrel Select to it. Merry Christmas, or whatever yuletide holiday you may happen to celebrate!